George Street Services is a woman-owned small business focused on solving the toughest challenges in the intelligence and cyberspace communities. George Street is an action-driven technology company providing software and IT solutions. George Street provides practical software engineering solutions for our customers. We use the latest software practices and technologies to develop innovative solutions. Our engineers specialize in management of big data and web technologies. George Street offers certified engineers to secure your IT infrastructure. Our experienced engineers can provide complete Cybersecurity solutions to help protect everything from critical corporate cloud systems to web applications. George Street’s certified engineers can help manage your enterprise technologies. Our IT staff provide affordable solutions to manage spending and transform system infrastructure to optimize your IT organization. George Street is looking for cleared applicants for software and system administration positions. 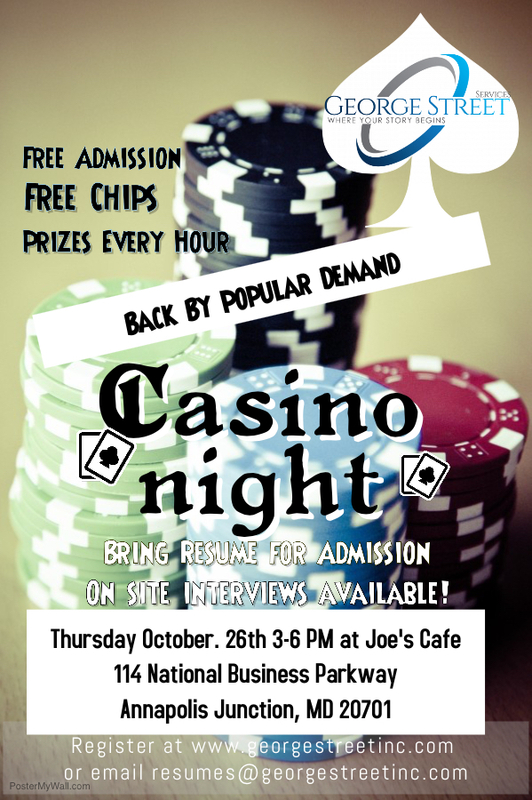 Join us for a a fun evening of games while we discuss your career goals. This will be a fun opportunity to play several casino games with out risking your own money. Each hour during the evening, gift card prizes will be awarded. Bring your resume for admittance. This event is for software and system adminstrators that already hold a clearance and are looking for a new Job. To register send your resume to resumes@georgestreetinc.com. Get your career started down the Super highway with George Street!